Rejoice, Toyota lovers, the new Corolla is finally here and available at Hesser Toyota in Janesville! That's right, drivers can get a look at and test drive the latest edition of the legendary reliable compact car that has been on American roads for years! The 2019 Toyota Corolla didn't receive a ton of updates and changes, but it's still new! We'll break down everything you need to know about the 2019 Toyota Corolla right here! The purpose of these model research pages are so drivers can learn about the newest and most popular vehicle models quickly and concisely. We're going to look at everything about the 2019 Toyota Corolla from its engine specs to its technology to its safety features! Let's see what the newest Toyota Corolla has in store for drivers! Why not start underneath the hood? The 2019 Toyota Corolla comes standard with a punchy and efficient 1.8-liter 4-cylinder engine that offers a solid 132 horsepower and 128 lb-ft of torque. But, we know Corolla drivers are more concerned with efficiency! The Corolla's Valvematic engine technology allows it to offer an incredible EPA-estimated 40 highway mpg! The 2019 Toyota Corolla is also more advanced than ever thanks to standard integrated Bluetooth technology with voice commands. Drivers and passengers can connect their phone and play their entire music library and answer calls without ever having to look at their phone! Plus, the standard backup camera is there to make parallel parking and tight corners easier than ever! On the inside of the 2019 Toyota Corolla, drivers will also find a stylish, comfortable and sporty interior that they won't normally find in a compact. The available SofTex-trimmed seats provide a leather-like surface that is water- and stain-resistant and provide more than enough support. Plus, the 60/40 split rear seats are there when you need a little more trunk space than normal! Of course, it wouldn't be a Toyota if safety didn't come first. 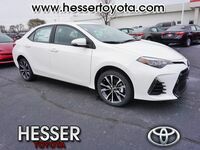 The 2019 Toyota Corolla is no different as it comes with some of the latest and most advanced safety features and technologies thanks to Toyota's Standard Toyota Safety Sense. Features like the Dynamic Radar Cruise Control, there to help make long-distance traveling easier than ever. How it works is that it uses radar technology to detect the distance between you and the car ahead of you during cruise control. If you rapidly approach the car in front, it will automatically slow down until you pass the car and then return to your predetermined speed. Want to learn more about the 2019 Toyota Corolla? Ready to get behind the wheel of one? Contact our staff at Hesser Toyota for more information or to schedule a test drive today!